Losing a loved one is never easy. Sometimes the passing is expected after a long illness, and there are five stages of grief associated with this type of loss. Other times death comes suddenly, and the shock adds another dimension to the grief resulting in seven stages of mourning. 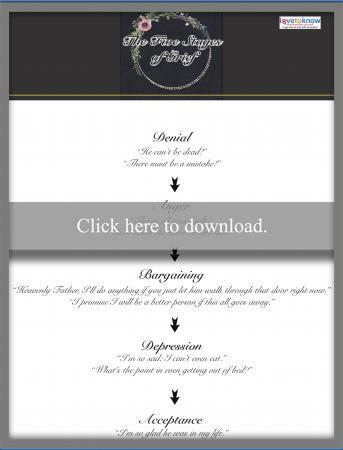 Either way, people go through a variety of emotional stages as they mourn. 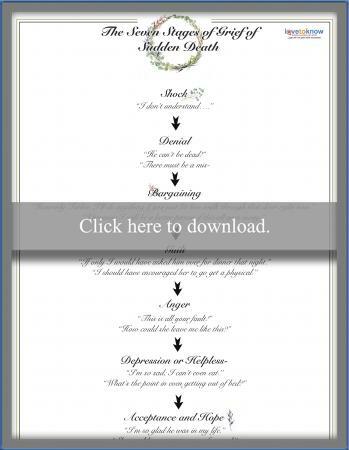 Dr. Elisabeth Kubler-Ross developed her model of the five different stages of grief in her book On Death and Dying. She was careful to point out that everyone grieves in his or her way; there is no rigid order to these stages, and an individual may or may not experience every single stage. For help downloading or printing the printable version below, refer to the Guide for Adobe Printables. A person experiencing denial refuses to accept the fact that his or her loved one is really gone. This stage can last longer for some people than others depending on their individual circumstances, but most people eventually come to terms with the fact that their loved one has passed away. Not attending the funeral in order to avoid facing the reality that someone who was very important to them is truly gone. It's not unusual to feel angry about a death. People can feel angry with themselves, other people involved in the situation, and even with the person who has passed on. Grief is a strong emotion, and anger sometimes functions as a vent. During this stage of mourning, people often try to make a deal with their higher power in an attempt to bring their loved one back. Most people who go through the bargaining stage realize on some level that this won't actually happen, but bargaining can give them a little more time to come to terms with their loss. Depression can be a mixed bag of emotions, including grief, regrets about things left unsaid or undone, loneliness, and a fear of facing the future. On a more positive note, depression can also be a sign that a person has begun to accept the loss, and that can become a point where healing begins. At this stage, a person is finally beginning to accept his or her loss. Depression may still be part of the picture, but it becomes easier to be more objective about the situation and begin moving forward again. When a loved one passes away quickly or unexpectedly, there's no time to prepare for the death on any level. This can often make it more difficult to adjust to the loss. 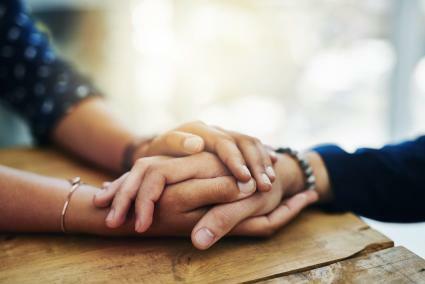 There is a lot of common ground in mourning any type of death, but some mental health professionals break mourning a sudden death into a few more distinct emotional stages than Kubler-Ross. A person might experience any of these feelings, and will probably experience more than one at a time. 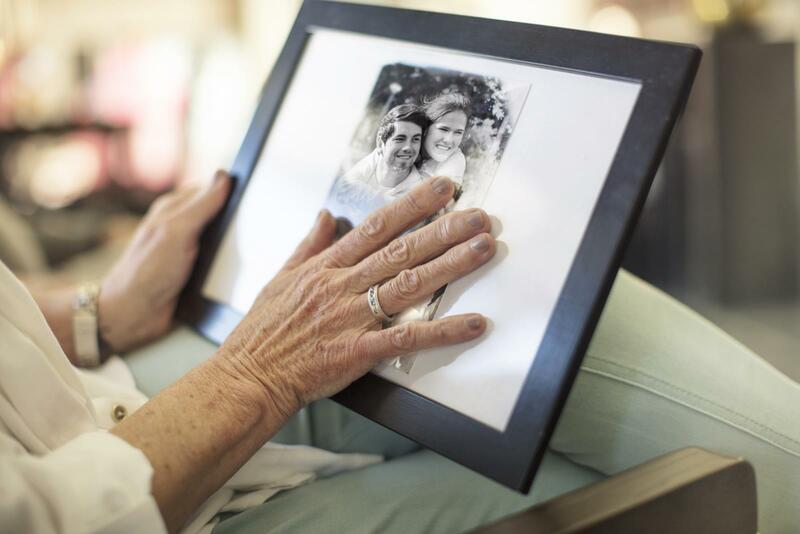 Receiving the initial news of a loved one's sudden death can be overwhelming. The shock of it all can leave some people feeling like they're living in a fog or a dream, and they're temporarily unable to process their feelings. When death comes suddenly, it's not unusual to believe someone has made a mistake. Some people may hold on to the hope that the deceased was just and isn't really dead. That hope fades as the reality of the situation sets in. Trying to make bargains with God, a higher power, or the universe in order to make the death unreal is characteristic of this stage. And while most people recognize that a deceased person will not return from the dead, this stage has an underlying theme of acknowledging the death, an important step toward eventual acceptance. In this stage, grieving people wonder if they could have done anything differently to avoid the death. "If only I would have asked him over for dinner that night," or "I should have encouraged her to go get a physical" are the types of thoughts a person in this stage might have. Grieving people might be mad at themselves, at the deceased, or at the circumstances. Like the Bargaining Stage, this stage requires some acceptance of the death as real and is, therefore, an important step. Once the fact of the death actually sinks in, a period of profound sadness will likely follow. People in this stage may display traits of depression, but this does not mean they are clinically depressed. Accepting a death doesn't mean you're not sad about it or that you don't care; it simply means you have worked through your feelings and can move forward. You might move forward sad or angry, but life must go on for those left behind. Sometimes people find it too difficult to deal with their grief alone, and there are a number of things they can do to improve the situation. No matter which stages you experience, the following advice can help you work your way through the mourning period. Allow yourself to grieve. There is no shame in crying and letting all your emotions out, no matter what those emotions are. Get support. Spend time with others who share your loss. This can help lighten the burden, much like a form of group therapy. Work through grief using traditions. Take part in all the traditions and rituals that go with laying someone to rest. These steps can help you work through the grief. Keep an eye on your health. Stress and grief can lead to illness, so try to eat healthy, regular meals, and get as much rest as you can. Seek professional help if you need it. Your personal doctor or a counselor who specializes in grief can help you put things back into proper perspective as you go through mourning. Mourning is not a set process. People can feel a variety of emotions at such a stressful time, and it takes time to work through them. Just try to remember that the worst part of grief eventually passes, and you'll learn to adjust to life without your loved one. Making that adjustment doesn't mean you love that person any less; it's simply a testament to the fact that life does go on.